Alistair Kirk bagged a Superbike double at St Angelo. Alistair Kirk notched a double at the penultimate round of the Ulster Superbike Championship at St Angelo in Enniskillen on Saturday. Kirk, riding the AKR/McCurry Motorsport BMW, qualified on pole and dominated the opening race. After ten laps of the 1.2-mile airfield circuit in Co. Fermanagh, he took the win by almost 11 seconds from Aaron Armstrong on the Liam Connolly Suzuki, with third place going to Paul Gartland (North West Gas Kawasaki), who was a further 2.2 seconds behind. Ryan Gibson took fourth on the JMC/Gibson Motors Suzuki, while the top six was completed by Stephen McAdoo and Superbike Cup rider Dylan Leonard, who set a new lap record for the Cup class of 70.710mph on his 600 Yamaha. Race two proved a much closer affair as Armstrong gave Kirk a run for his money. In the end, Kirk closed out a double, but his margin of victory was only a tenth of a second, while Gibson improved from the first race to finalise the top three. Gartland, McAdoo and Leonard rounded out the first six. In the Supersport class, there was no stopping Jason Lynn as he continued his winning run on the Walter Bell Yamaha. Lynn, though, did not have it all his own way as he was pushed in race one by Simon Reid (visorshop.com Triumph), who was only one second down at the line. Mark Conlin was 2.1 seconds in arrears on the Magic Bullet Yamaha as he sealed third spot ahead of Aaron Armstrong (Triumph) and Christian Elkin on the Bob Wylie Yamaha. Lynn again had the upper hand in the second encounter but once again he had to fight for the win, with Conlin emerging to test his resolve. There was little to separate them but it was Lynn who shaded the verdict by 0.2 seconds at the finish, with Elkin almost five seconds further behind as he finished on the podium. Armstrong slotted into fourth, only 0.2 seconds behind Elkin, while Reid was fifth on this occasion, setting a new Supersport Cup lap record of 72.857mph. Gary McCoy doubled up in the Supertwins class, twice beating Stephen McKnight. Cahal Graham finished third in the opening race, while Ross Irwin made it onto the podium in race two. Irwin, who is from the famous racing family in Carrick, only made his short circuit debut last month. Shane Sweeney and Adam Crooks won the Production Twins races. Paul Robinson won both Moto3/125GP races as the Ballymoney rider edges closer to his retirement from the sport following the Sunflower Trophy meeting in less than two weeks’ time. The Ballymoney rider marked his retirement from road racing in fine style last month, taking victory at the East Coast Racing Festival at Killalane from Gary Dunlop. Josh Rae was a double winner in the Young Guns Challenges races on Saturday, with Cameron Dawson and Jonny Campbell claiming a win apiece in the Junior Cup class. Ballymoney man Daryl Tweed won both Lightweight Supersport races on his M&D Racing Kawasaki, beating Stephen McKeown and Gary McCoy respectively. Johnny Aiken and Andrew Brady won the Pre Injection races. The final round of the championship will be held at the end of season Sunflower Trophy showpiece from October 19-20. 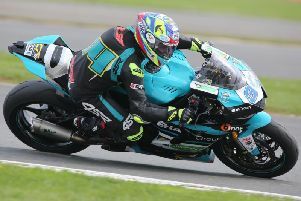 British Superbike rider Richard Cooper has been confirmed on the Buildbase Suzuki as the Nottinghamshire man prepares to make his debut at the event at Bishopscourt in Co. Down. Lisburn’s Carl Phillips – third in the Sunflower feature race in 2017 – will also make his racing return on a Kawasaki Superbike for JMC Racing. Other leading names are set to be announced soon.